April showers bring May flowers. But let's not get all doom and gloom and April-is-the-cruelest month, OK? Because where there are rain showers, there is bound to be a rainbow or two. Or ten! 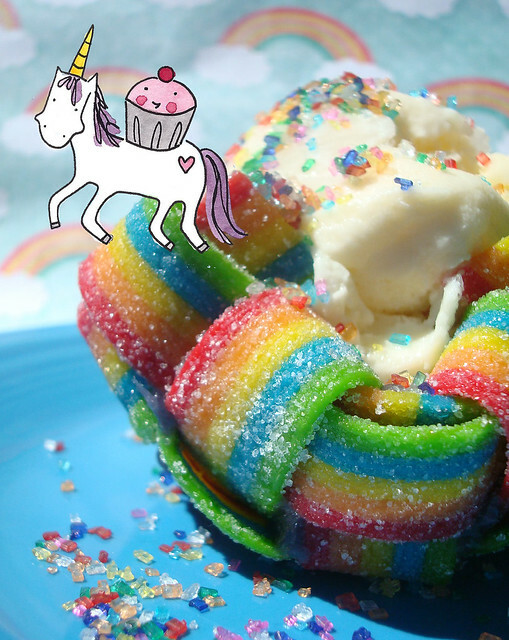 To celebrate this magical rainbow-filled month, I would like to present a project sponsored by Airheads candy which has attained this site's highest status as unicorn-approved: rainbow candy dessert bowls. 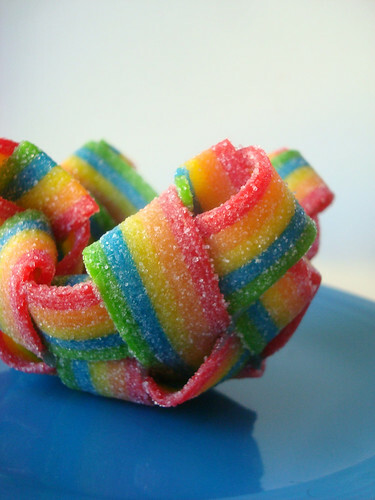 These confections are woven from candy, and are a perfectly magical setting for all of your favorite desserts. You could fill them with whipped cream or marshmallow fluff for a light and sweet cloud-like treat, or you could place an entire cupcake inside. 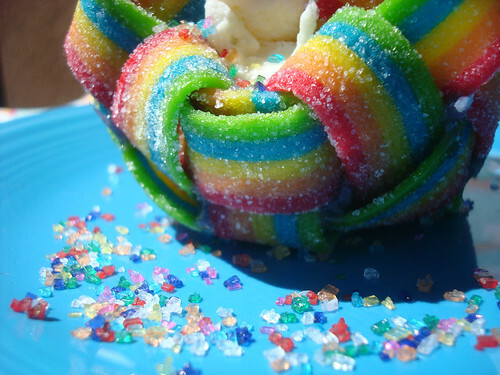 They could even be used as decorative candy bowls at parties for a sweet table setting. I should tell you too that this project was inspired by my time in Bali. Perhaps not for the reason you think, though! You see, I had agreed to come up with a project for Airheads before I left, and I figured "meh, I'll find someone's oven to bake in.". Well, as it turns out, they don't have ovens in Bali! 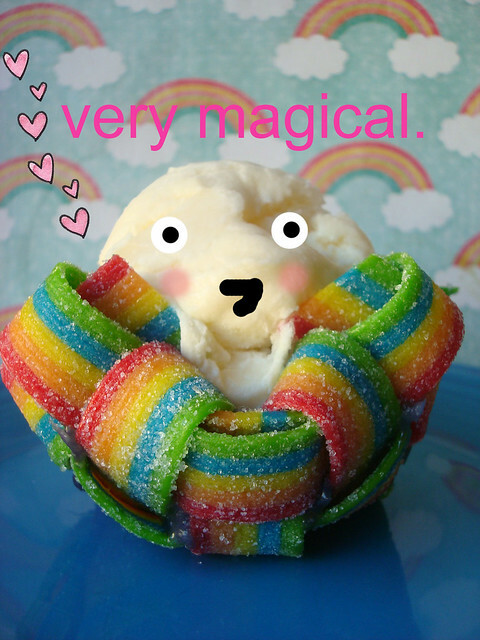 So I had to revise my plans and figure out a no-bake treat. 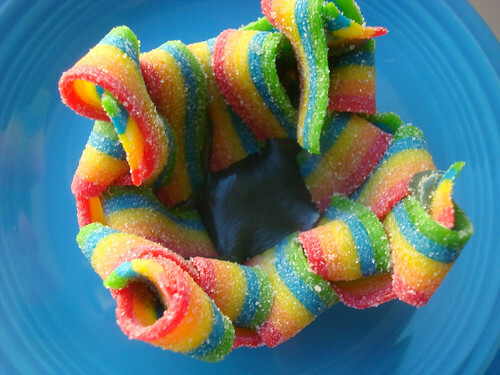 I thought back to my friend Not Martha's bacon bowls and an idea was born--a sweet idea, indeed. I have to say, I was rather pleased with my experimentation. It took a little figuring out, because once I wove the rainbows I had trouble getting them to stay together while I shaped the baskets. By employing regular Airheads candy, I melted them down and then used them as a sort of sealant for the inside of the baskets. It helped keep the candy together, and as an added bonus, sealed the inside so that if eating ice cream or something of the like, it would stay contained in the basket. You could go for a plain, cloud-like look with the finished baskets, or include additional rainbows. Definitely not excessive. Anyhow, I know that you're probably keen to make this magic happen in the comfort of your own home, so here's how I did it. I realize it seems like a long process based on my writing, but it's really not; I just wanted to be thorough in my explanations. You're welcome! Grab a work surface and let's get weaving. 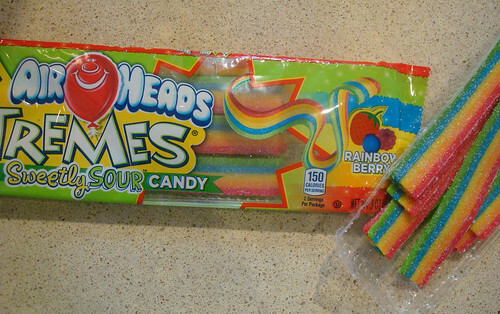 First, grab yourself 10 strips of the rainbow colored Airheads Extreme candy. Line five strips side by side, so that the ends are facing you. Leaving an inch of space on the top, begin to weave one of the remaining strips of candy horizontally, over and under the vertical rows. Grab your next piece, and weave it directly below the previous one, weaving under-and-over so that it forms a basketweave pattern. Continue alternating with the remaining strips. OK, set this woven piece of rainbow art to the side for the moment. Now, set up your double boiler. 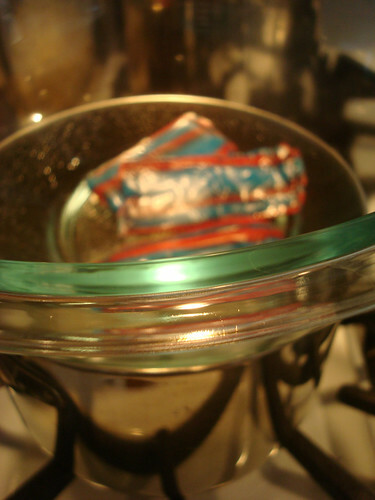 Place three Airheads candies (the regular kind) in the top, along with the water and confectioners' sugar. Heat on medium, stirring every few minutes. While at first the sugar, water, and candy will remain quite separate, as it melts, the mixture will become thick. You'll see now why it was a good idea to use candy in the same color scheme--the color melts together. It might be ugly if you use different colored candies (like I did the first time) but it will taste fine. Promise. But even so, this won't be the prettiest part of the process. Once the mixture is lightly bubbly, remove from heat. You'll want to work without hesitating at this point as the candy is easier to use while still quite liquid. Gently spoon the candy in the center of your basketweave square. Use a spoon or knife to spread it to cover the woven portion as thoroughly as possible. At this point, I decided that rather than slice off the extra bits, I would fold over the non-woven portions. This is easier to do if you start with the pieces which are "under". They will adhere easily to the still sticky candy. The four corners, I sliced off. 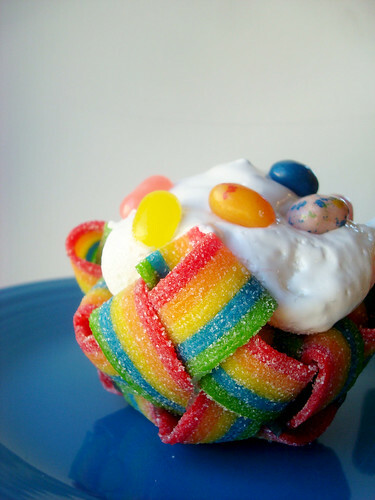 Give it about five minutes for the candy to set slightly, and transfer the candy bundle to your cupcake tin. Gently place it, centered, on top of one of the cups. Using your fingers, gently finesse it into a bowl shape. Once again, here it all is in pictures. My apologies again for the weird melted candy color. Repeat, making as many bowls as you'd like. To help the bowls "set", I put them in the freezer (right in the cupcake pan) for about 5 to 10 minutes. They easily popped out of the cupcake tin at this point. Fill the bowls with whatever toppings you'd like. 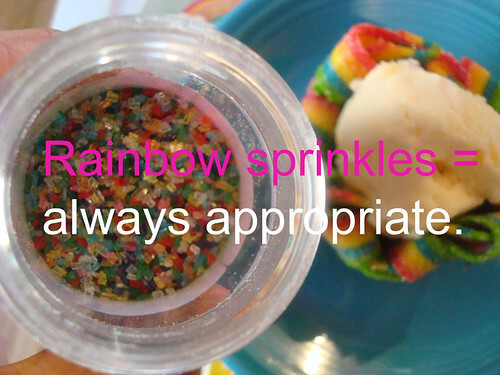 If you're not using them immediately, keep them in the cupcake tin so that they will retain their shape. 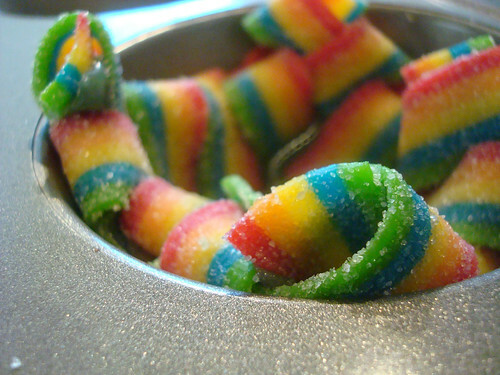 What would you put in a rainbow bowl?